220 pages | 26 B/W Illus. This book is a 'crossover' treatment of quantitative and qualitative risk analysis within the setting of new high technology ventures in the UK. Reid and Smith have based their research on extensive fieldwork in patent-intensive, high-technology firms. This has included face-to-face interviews with leading investors, and is illustrated by two chapters of case studies. Their aim is to advance the understanding of methods of risk assessment and to illuminate current policy concerns about stimulating innovative output and securing intellectual property. This book is unique in being academic in intent and purpose, yet strongly grounded in practice, without becoming merely a practitioner volume. 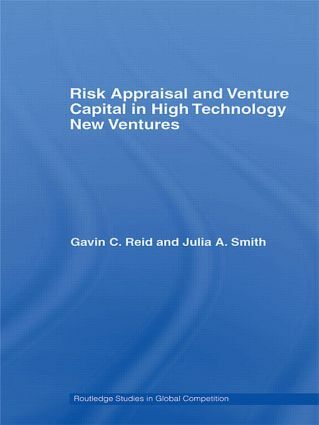 Reid and Smith find a considerable consensus in the venture capital industry on the spectrum of investments by risk, and on key commercial factors affecting risk. This book offers a useful and interdisciplinary approach to an increasingly popular field of study.